Although our site is still under construction, El Bolso covers Nacional’s first stage of the 2014 Copa Libertadores. Hello sports fans, El Bolso is back! Last year Jobu took you through Nacional’s short-but-exciting run through the Copa Libertadores; this time around he’s busy with the site redesign, so I thought I’d break into the office while everyone’s away to share my love of the Tricolores with you. Hopefully we’ll be able to do this for a few more games this time around. This year, Nacional faced a new challenge: a third place finish in the local tournament sent them not into the group phase of the cup, but to a preliminary home-and-away playoff for a spot in the real deal. These playoffs have been around since 2005, when the powers that be realized they could make more money simply by increasing the number of teams involved. The lowest-ranked teams from each of the participating countries are matched up by draw, and off we go. Since only the lowest teams are placed in this round, Nacional had yet to take part in it (old friends Peñarol are a regular participant), but there’s a first time for everything. They were playing for the right to participate in their 18th consecutive Libertadores group stage, which is a record. Nacional was paired up with Oriente Petrolero, a humble team from the oil field region of Bolivia. That was good news: Oriente comes from the flat part of Bolivia, so there would be no altitude to deal with. Also, teams from Bolivia’s oil fields have been good luck for Nacional: their first Libertadores title came in 1971, when they were paired up with Chaco Petrolero in the first round (along with Peñarol and, I kid you not, The Strongest of Bolivia). In 1980, Nacional won their second trophy, and they started by eliminating Oriente Petrolero and, once again, The Strongest (which seems to be a pretty misleading team name). Now for the bad news: a week before the first game, Nacional players were involved in an on-field scuffle during a summer friendly against Peñarol, and a combined 9 players from the two teams (and their children, and their children’s children) were banned from taking part in any sporting events… for two months. The ban came not from the soccer federation but from a court of law, and while it only applies to events in Uruguayan territory, an appeal from the DA kept the suspended players from making the trip to Bolivia (thanks for nothing, Mr. McCoy). El Bolso is not here to comment on how ridiculous it is for people to not be able to work at their chosen profession because of a law that was created to deal with unruly fans; I’m just telling you this because it had an impact on the games themselves. Nacional would face Oriente without starters Diego “Mama” Arismendi and Ignacio “Nacho” González (yes, the funny nicknames are back). Without their strongest midfield defender and their best offensive creator, they’d have to rely on a mix of aging stars and fresh faces to advance. The first game was played on January 28 in Santa Cruz de la Sierra, Bolivia. The game wasn’t great, as would be expected from two teams just getting into playing rhythm after the summer holiday break. I thought Nacional played better and showed a fresh look. Coach Gerardo Pelusso, who is back after taking them to the Libertadores semifinals in 2009 (the only time Nacional has managed to make it that far since their last title in 1988), is working on a strategy based on quick, precise short passes, and it makes for some pretty entertaining soccer. However, their back line was absolutely horrendous and gave up several runs through the middle, one of which culminated in a beautiful strike by Gualberto Mojica in the 33 minute. Nacional tried to get an equalizer, but the lack of precision up front and Oriente’s strong defensive play made the goal held up. The teams would travel to Montevideo with Nacional needing two goals to go through. The return game was played on February 4 in the Parque Central, Nacional’s home stadium. I knew the team needed all the help it could get, so I arranged for Jobu himself to watch the game with me. Again, Nacional looked to be the better team, with youngster Carlos De Pena and and established star Iván Alonso making things tough for the Oriente defense. In the 18 minute, Nicolás Prieto, another young midfielder making his mark on this team, sent a shot on goal from about 40 yards out, which the Oriente goalie barely pushed away. The resulting corner kick was sent into the heart of the penalty box by Peruvian newcomer Rinaldo Cruzado. After a redirection from a Nacional player, Alonso softly headed it into the far post for a 1-0 lead. Despite several chances to add to the score, Nacional went into halftime up one, which meant the game would be decided via penalty kicks unless one of the teams managed to score. The second half was more of the same. Alonso kept trying for that second goal that would give his team a spot in the next phase, but three times his beautiful strikes were negated by defenders and the posts. In the 63rd minute, Argentine defender Mariano Brau was shown a second yellow for a nasty foul on a Nacional player and left Oriente a man down, and Nacional dominated even more. Still, with the aggregate score tied 1-1 and a defense that was not to be trusted, nothing was certain. Nine minutes later, a gorgeous give and go between Alonso and substitute Alvaro “el Chino” Recoba (yes, he is still around) ended up with De Pena getting the ball on the left side of the box. His shot wasn’t the best, but it inexplicably trickled past the Oriente goalie for a 2-0 score, and the deed was done. There was one clear chance on the last play of the game for Oriente to get back to 1-2 (which would have given them the overall win because of away goals), but the shot barely missed Gustavo Munúa’s right post for a goal kick. The referee ended the game soon after that, and Nacional was in the group phase. So what did we learn from these two games? 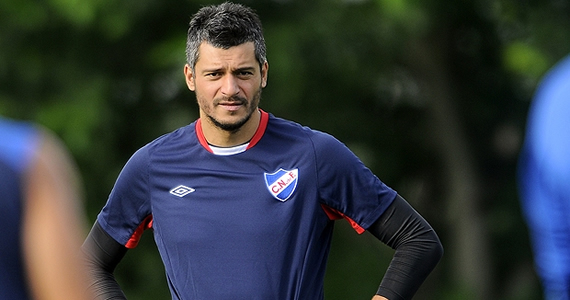 Pelusso has Nacional playing an attractive brand of soccer: chock full of precise short passes and quick movements. However, the finishing needs some work, as Alonso is usually mobbed by defenders and Richard “el Canguro” Porta has not found his best game yet (although he has been a big help in controlling the midfield). The defense looks slow and uncoordinated, which didn’t really hurt them here but will as the tournament progresses. Bringing Munúa back, even at 35 years of age, has looked like a great move so far, as he stepped right into the starting keeper job and has been very solid in both the Libertadores and the local tournament. This is a strong roster, with a good mix of crafty veterans like Recoba, Alonso and national team defender Andres Scotti, and a gaggle of talented youths like De Pena, Prieto, and two creative midfielder types: Gonzalo “Nano” Ramos, a starter in the first game, and Gastón Pereiro, who has been getting minutes as both a starter and a substitute and has shown flashes of brilliance as he tries to fill Nacho González’s shoes. Still, Oriente Petrolero showed very little in these two games, and the level of competition is about to take a big step up. Nacional is in Group 6 of the Second Phase, matched up against three perennial continental powers: current Argentina champion Newell’s Old Boys, Brazilian runner up Gremio of Porto Alegre, and Atlético Nacional, which won both the opening and closing titles in Colombia last year. The next phase begins this Thursday when Nacional hosts Gremio. Given the caliber of all the teams in the group, a good result is crucial to Nacional’s hopes of advancing to the knockout phase.